Scott Farrar – thoughts on teaching, technology, education, and math itself. When we as teachers describe the complete set of necessary and sufficient conditions for an idea, we are attacking the idea from the wrong side. We are looking backwards at a completed experience; we trim and groom the idea into neat precision. But these are difficult statements to learn from. We must remember that as a learner, we don’t know where we are going. What I do consider “new” is the opportunities that Geogebra affords us. It, building on predecessors like Geometer’s Sketchpad and LOGOwriter, allow students to manipulate images and ideas of mathematics in ways that have never been possible before the computer. We can consider and present visuals for whole spectra of examples. When presenting angles on parallel lines, it seems so simple to us in retrospect, we as teachers are sometimes confused at how students make mistakes in identifying angle pairs, or conditions under which certain relationships occur. I believe a large part of that is that a textbook is confined to a limited amount of space on the page. They literally cannot afford to print the multitude of illustrations that would give a small insight into what angles look like on a transversal between non-parallel lines. But with Geogebra, we can allow students to not only see many many visuals, we allow the student control. We allow the student’s mind to decide on the zig-zags she wants to take. So that in the style of Serra, she can make conjectures about the situation based upon her experiences. 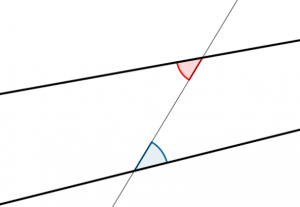 When does Angle – Side – Side “work” ? Q: If we copy two sides and a non-included angle from one triangle, do we get a congruent triangle? These cases of “sometimes” are ripe for exploration with manipulatives. And with Geogebra, we can create a manipulative fine-tuned to explore the ideas we want to cover. With the applets I create I try to pose a simply-worded singular question that strikes towards the heart of the matter, but I hope and expect that other questions will occur within the classroom– from students. What kinds of questions might an interested student consider in the course of exploring this applet? What kinds of questions might you hint at or give to a disinterested student? If you haven’t yet had the chance to create anything in Geogebra, it may seem daunting on how to get started. I have a couple activities that may ease you in, allowing you to get your feet wet. 1. Download Geogebra (its free) at www.geogebra.org It works on Windows, Mac, Chromebooks, and even within a webpage. 2. Open it up and construct a triangle ABC. 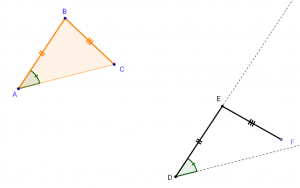 Find tools for perpendicular bisectors and bisect each segment. Construct the intersection point D of two of the bisectors. Use the circle tool to create a circle centered at D with radius DA. You can see and download all of my geogebra creations with the link at the top right of this page ( My Geogebra Creations ). I also post periodically to the main blog page about items I have created. Finally, I post on twitter @farrarscott if you would like to follow me. Lakatos, I. (Ed.). (1976). Proofs and refutations: The logic of mathematical discovery. Cambridge university press. Polya, G. (1954). Induction and analogy in mathematics. Princeton, NJ: Princeton University Press. Serra, M. (2003). Discovering geometry: An investigative approach (Vol. 4). Key Curriculum Press.